Covering two months in one, this time around you can investigate a series of murders in a remote mansion or an incident at a museum that may be more than it seems. You could also direct one of three different monsters seeking to lift the curses from their lives, a bellboy recruited to a spy job, or a man simply seeking to get back home. Alternatively, you can enjoy a calming sojourn on a sunlit island, or discover how even the simplest tasks can be less than calming for a person with Asperger’s Syndrome. 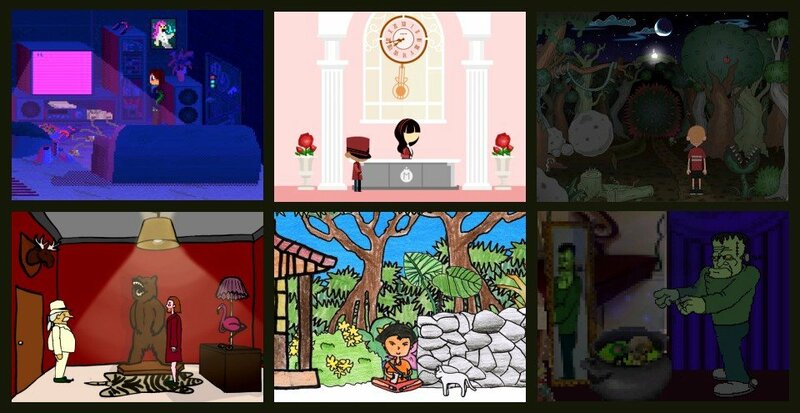 All these await you in our latest roundup of releases from the freeware scene. AniSlaughter Inc are about to open a new store called Snappy Trapz, where they’ll sell torturously trained crocodiles that can be used as mouse traps. Harry, a sleepy fighter for animal rights, has to break into the store and set the animals free while his friend Barney demonstrates outside. But Harry has his work cut out for him: even after gaining entrance he has to find a way to set the crocs free. On top of that, he has to deal with the shop's director, who sneaks in on him at an inconvenient time. Kini's debut game Harry and the Locked Crocs Shop Shock is shown in third-person mode featuring hand-drawn graphics with large swaths of single colors – dark red, green and yellow prevailing. The game takes place in and around Snappy Trapz, with Harry visiting the area in front of the store, the shop floor and the director's office. The action is accompanied by simple tunes, the melody depending on the location. There are no sound effects or voices, with all spoken text displayed on-screen. Using the mouse, right-click cycles between the verbs look, talk, walk and interact, with the cursor changing to the appropriate shape. Left-clicking performs the chosen action. Moving the cursor to the top of the screen makes a menu appear that contains icons for the same verbs as well as the inventory. The few puzzles range from item-based obstacles to dialogue and are well integrated into the game, which takes about 15 minutes to finish. 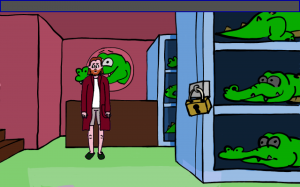 Harry and the Locked Crocs Shop Shock can be downloaded from the Adventure Game Studio website. 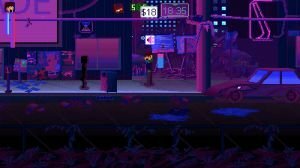 An Aspie Life takes place on a typical weekday evening and is presented in dark, low-resolution pixel art awash in blues, reds, and purple. The camera is placed a little bit below eye level and the environment pans right and left to keep the protagonist, who we only know through his online name iTiO001, in view. He lives in a rather run-down area of a big city, which is not very suitable for people with Asperger’s. The cars and shops on his street make him very nervous, sometimes so much that he has to stand with his head and his hands against the wall for a time, shutting out as much of the noise and light as possible before he can continue. Apart from the sounds of the city there is also background music, both the tune and volume depending on the protagonist’s mental stability. The score is intended to make players anxious, especially when the protagonist is feeling very bad, to appropriately convey his state of mind. You will also hear ambient effects like footsteps and money changing hands, but these are quite basic and not a major part of the experience. There are no voices in the game; all spoken text is shown in subtitles on the screen. The left and right arrow keys make iTiO001 walk, and at certain places you can press Enter to perform actions like entering a door or getting a bag in a shop. In some situations, however, such as when talking to someone, I found the interface very confusing and I often started pressing random keys, hoping for the game to proceed. You can follow a short tutorial at the start of the game but it covers only the basics, which leads me to believe that maybe this was done on purpose to show the main character’s helplessness in certain situations. At the top left of the screen is an image of the protagonist’s head, showing his current mental state. Beneath that are two vertical bars and the shorter they are, the worse the condition of the protagonist and the louder the background audio, not only in volume but also the type of noise. You can call up a sort of diary in which iTiO001 writes about his experiences and the things he wants or needs to do. He has also has written down a few handy tips for dealing with different situations, to help him when he encounters them. The one big puzzle in An Aspie Life is how to stay as calm as possible, which gets harder as you encounter more things to do, like looking for a girl you met earlier. Though no game could truly convey how how hard life must be for autistic people, this experience will certainly help players understand them better. An Aspie Life can be downloaded from Game Jolt or Steam. Dracula, Frankenstein and the Mummy are tired of being dead and/or ugly. They are also sick of being imprisoned in Arkatum Monster Asylum, so they break out and plan to find Transylvanian Gypsy Romona, who may be able to lift their curses. Of course, three is a crowd so you, the player, must help one of them while the others find Romona together. FrightFest, by slasher, was the winner of MAGS competition for March 2018. The game takes place at night and the pixel art can be so dark that I had to set my screen brightness as high as possible to see everything. Despite the low visibility, however, the backgrounds are beautiful and detailed, with gradually changing colors. The figures of Frankenstein, the Mummy and Dracula, together with some other monsters and animals you come across, are depicted in higher resolution and in a simpler style than the environments. Your chosen protagonist has to cross a swamp, traverse a forest, and pluck some mushrooms in a clearing full of bog holes before reaching Romona. Eerie music accompanies the action, and you will hear a lot of ambient sounds, such as the wind from a storm, rain, and creaking wood. There are also some simple sound effects for things like squashing a spider, shaking a tree and other violent things. With no voice-overs, all dialogue is displayed as on-screen text. 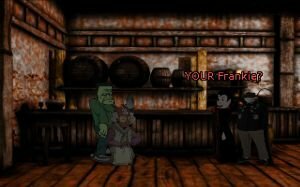 The protagonist goes where you click, and a small description of the monster you’ve chosen to help is written in the lower part of the screen. Left of this is an icon from which you can access your character’s supernatural ability: for instance, Dracula can turn into a bat and Frankenstein has super strength. On the other side of the text are icons for regular verbs walk, talk, interact and look, and beside those is the scrolling inventory. The puzzles are really easy, and there are only a few of them, ranging from finding and catching a spider to remembering the name of a constellation. Most of the puzzles are the same for all monsters, so only the their special abilities provide some variation and replay value. The lack of puzzles is compensated for by the atmosphere and funny situations you will find yourself in, as despite its name, FrightFest is not scary at all throughout its pleasant 30-minute or so play time. FrightFest can be downloaded from the AGS website. Journey Home, by Neat Fire Games, may be based on a clichéd story concept, but it’s explored in a lovely, refreshing way. The graphics are hand-painted in beautiful high resolution, presented in third-person mode. 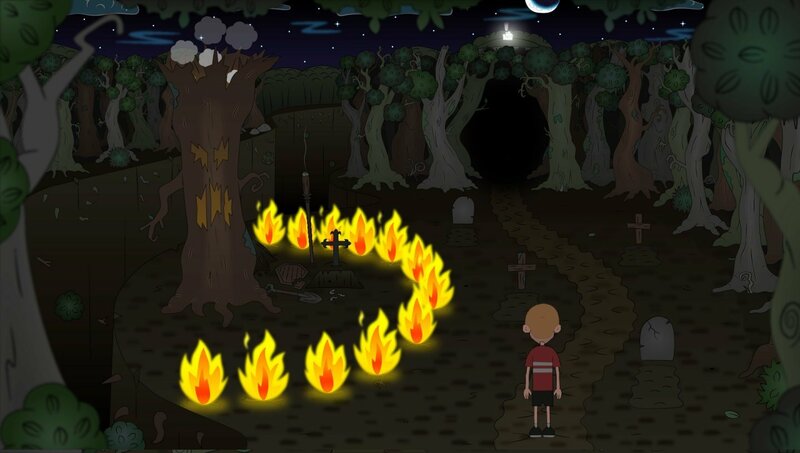 The protagonist is a nameless boy around nine years old, who must traverse a forest, cross a deep gorge and river, and visit a strange graveyard before reaching the house. There is no background music or speech in this game, so all you hear are the noises you and your surroundings make: the rustling of leaves and rain, the sounds of animals, breaking sticks, creaking mechanisms and so on. All these effects are realistic and quite soft, making Journey Home seem like a relaxing, quiet experience. However, you come across some gruesome sights during your quest: a dead man being eaten by a wolf, and a pool of blood that is all that’s left of a fisherman who was plucked from the shore by some fierce aquatic monster, to name two of the worst, although no really gory details are shown. Using the mouse, right-clicking changes the cursor between the familiar verbs walk, talk (although I didn’t use that one the entire game), look and interact. Moving the cursor to the top of the screen makes a menu appear with buttons for the same actions, your inventory, and saving the game. The puzzles are all inventory-based and get harder the further you proceed. You can die along the way, but most of the time the game rewinds time to just before you made your last wrong move and you can try again. The ending I encountered was a bit confusing, however, as I am still not sure if I died or just made it to the house. Journey Home has multiple endings, a few secrets you can find and even optional puzzle strands. It took me about an hour to finish this beautiful game. Journey Home can be downloaded from its itch.io page.